Sherman has been attacked with criticism for this and other interviews. The Pro Bowl corner has been labeled a “classes” as well as a “thug”. These are absolutely ridiculous labels to place on a player who just made the game clinching play. Lets not forget that this game was personal for the former Stanford Cardinal. First there was the fact that he had this ongoing rivalry with Michael Crabtree. The two had words for each other during Arizona Cardinals wide receiver Larry Fitzgerald’s charity softball game last year. 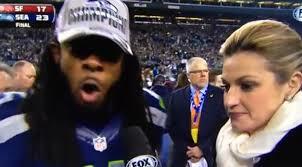 According to Sherman, “Crabtree said something to me, and I told him I’d make him pay for it on the field.” I don’t know about everyone else, but that sure does sound professional to me. Instead of going back at Crabtree over Twitter or Facebook, he went out and used it as fuel to win football games. Now lets get to the incident at hand. You just made the play of the game to clinch the NFC championship game against your bitter rivals. You just realized your going to the Super Bowl. You wouldn’t be excited? Richard Sherman took all of his energy, all of his excitement, and just let it out. He didn’t curse, he didn’t say anything inappropriate, he let the reporter ask her question in its entirety and responded. As far as his claims that he is the best corner in the game, he is. This season, Sherman recorded 8 interceptions (league high) and 16 pass defended. Furthermore, in 18 games, Sherman only allowed two receivers to go for over 100 yards against him. In this game, the all-pro corner held Crabtree to four catches for 52 yards. With numbers like these, he has the right to boast. What did you expect? Richard Sherman, in just his 4th year in the NFL, is going to his 1st Super Bowl. Forgive him if he was a little excited that all his hard work paid off. I didn’t like the choke sign but other than that Sherman not only walks the walk but talks the talk. If he didn’t it would be something but the numbers and performances don’t lie, he is the best in his position at the moment.